Why didn’t the pastor of Water City Church come to Interfaith Laughter Night? He thought it was an April Fools’ Day joke. About 50 people gathered for Interfaith Laughter Night, Friday April 1 at the New Moon Café. Representatives of nine different religious traditions participated; joke tellers ranged in age from five to 80. The idea for Interfaith Laughter Night emerged last fall, during planning the Interfaith Festival of Gratitude, which was held at the Grand Opera House the night before Thanksgiving. While I was getting acquainted with the leader of a faith community over a cup of coffee, my new friend observed, “We tell jokes about ourselves.” And suddenly, this religion that I knew nothing about became real to me. I was surprised by that conclusion. Could there be a connection between laughter and faith, I wondered. Theologian Reinhold Neibuhr wrote, “Humor is a prelude to faith; laughter is the beginning of prayer.” Laughing at oneself is an expression of humility and perspective. When I laugh at my own religious tradition, I acknowledge that while being Presbyterian works for me, there are other traditions that are life-giving to other people. It was refreshing to see people of so many religious persuasions together on April 1. 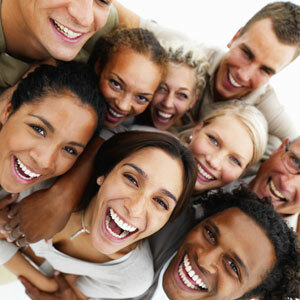 We all laugh in the same language. Jesus and the Buddha, oh Baha’i! You can imagine the sound of people of all faiths laughing together. It was the sound of civility, the sound of community, the sound of joy! Northwestern Community Columnist the Rev. Thomas C. Willadsen is pastor at First Presbyterian Church in Oshkosh. He has lived in Oshkosh since 1999.